Do you want to track your Contact Form 7 conversions and see how well your contact forms are doing? By tracking your form views, conversions, and conversion rates, you can identify exactly which forms are performing better, and gain insights to optimize all your forms for more conversions. In this article, we’ll show you how to easily track your Contact Form 7 conversions with Google Analytics. 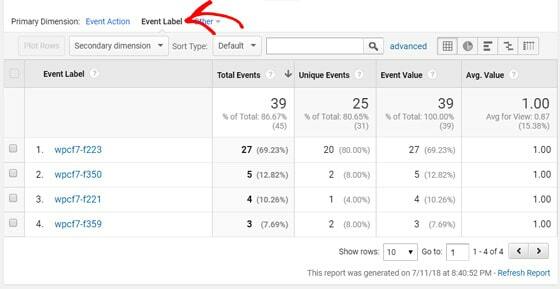 If you want to track your form conversions manually, you’ll need to set up event goals in the Google Analytics interface. By doing that, you can track your form impressions and conversions for each of your forms. However, it has quite an inconvenient setup process if you’re an absolute beginner. 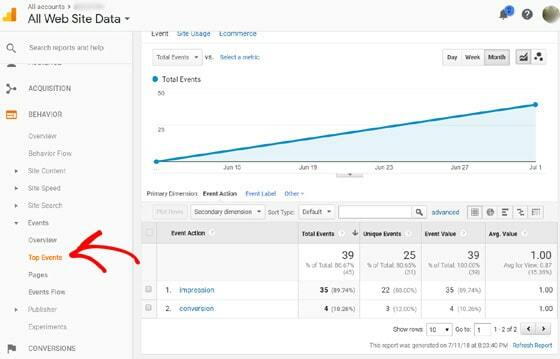 For detailed instructions, you can read our step-by-step guide on creating a goal in Google Analytics to track conversions. On the other hand, if you’re using MonsterInsights, tracking your Contact Form 7 forms is ridiculously easy; and it takes just a few clicks to set up. You can do the entire setup process, as well as view your reports, from within your WordPress dashboard without having to navigate away from your WordPress admin area. 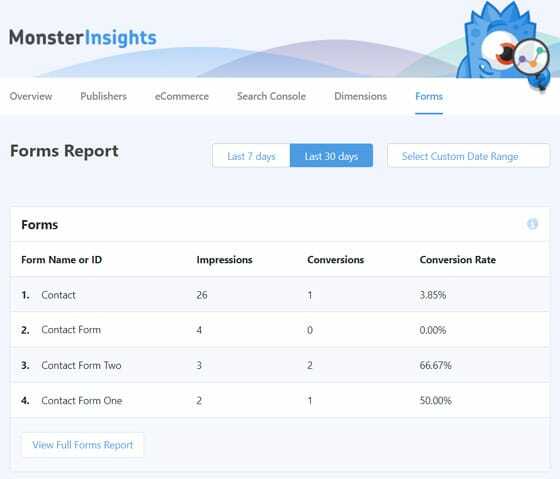 Why Use MonsterInsights to Track Your Contact Form 7 Conversions? 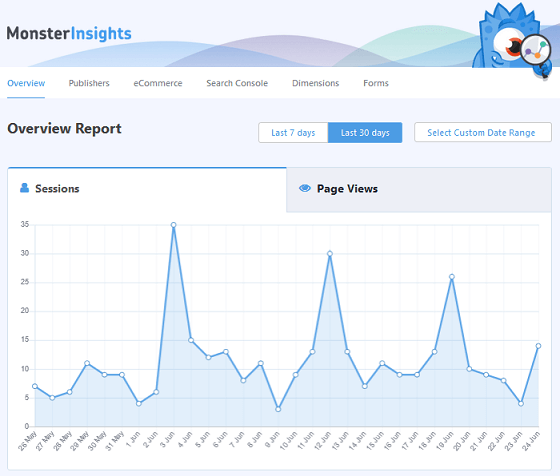 First, MonsterInsights is simple and beginner-friendly. You can easily set up and configure advanced tracking, like form conversions, without requiring any technical knowledge. It comes with a number of handy addons which automatically handle setting up and tracking advanced events including form conversions, eCommerce transactions, downloads, ads conversions, etc. For tracking Contact Form 7 conversions, all you need to do is to install MonsterInsights Forms addon. Easily set up and track form conversions without touching any code. You would need to hire a developer for setting up forms tracking otherwise. Configure form tracking options and view reports within your WordPress dashboard – way more convenient than using Google Analytics’ platform by itself. Get the real-time report of your contact form views, conversions, and conversion rates in the most comprehensive and beautiful interface. Identify which forms trigger the most conversions, and optimize low-converting forms. Supports all the major WordPress form plugins including Contact Form 7, Gravity Forms, and WPForms. As you can see, using the MonsterInsights Forms addon is the best option for tracking Contact Form 7 conversions. You can buy MonsterInsights Pro to enjoy this feature. 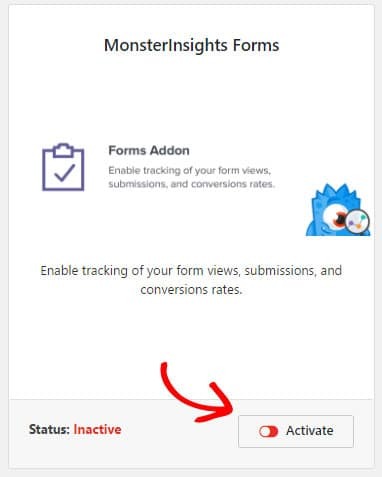 First, you’ll need to install the MonsterInsights plugin and connect it with your Google Analytics account. After the Google Analytics authentication is complete, go to Insights » Addons and find Forms Addon. Then, click the Install button. After the addon is installed, you’ll see the Activate option. Simply click the button to activate the addon. Then, you’ll see the addon’s status active. That’s it! You don’t need any further configuration. MonsterInsights automatically starts tracking your Contact Form 7 form conversions. But it will take some time before your form conversion reports appear in MonsterInsights. Note: Google Analytics normally takes 24 to 48 hours to track an event like form submission so it may take some time to prepare your first form report. But, once configured properly, it prepares real-time reports every time its refreshed. 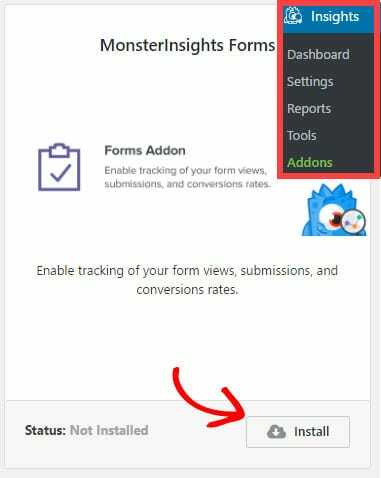 After you’ve installed and activated the Forms addon, you can view your Contact Form 7 conversion reports in your MonsterInsights Reports interface directly from your WordPress dashboard. To view the reports, all you need to do is to navigate to Insights » Reports. There, you can see the Overview Report of your entire site. To view form reports, go to the Forms link and click it. Then, you’ll see your Contact Form 7 reports just as shown in the screenshot below. There, you can view the number of impressions, conversions, and conversion rates for each of your forms. If you want to view further details regarding your form conversions, click the View Full Forms Report button at the bottom of the report. This will redirect you to Google Analytics » Behavior » Events » Top Events. Now, you can view the total impressions and conversions triggered by your forms in this page. If you want to view the impressions for each of your forms individually, then you’ll need to click on the Event Label link in your Forms report Primary Dimension. As you can see in the above screenshot, you’ll be able to view the total events for each of your Contact Form 7 forms individually. “Events” here refers to both the impressions and conversions. So, that’s how you can set up form tracking for your Contact Form 7 conversions and view reports in Google Analytics. We hope this article helped you to learn how to set up form tracking for your Contact Form 7 forms. If you found MonsterInsights useful for form tracking, download it today! Also, don’t forget to follow us on Twitter and Facebook for more Google Analytics tutorials.